I am not a morning person. It&apos;s 5 a.m., my alarm is blaring at some random interstate-exit hotel near Montgomery, Ala., and all I want to do is go back to sleep. 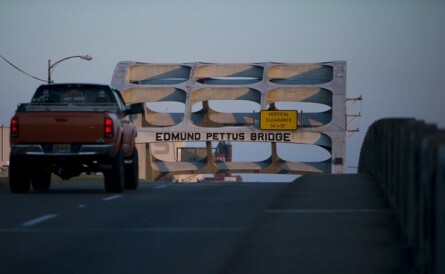 But I really want to get some beauty shots of the Edmund Pettus Bridge and the town of Selma bathed in sunrise light for our coverage of the 50th anniversary of "Bloody Sunday." The sun starts to peek over the treetops as I begin to walk across the bridge, shooting photos of mist on the Alabama River, reflections of the town on the water and, of course, the name of the bridge painted on the span itself. I notice a few camera crews hanging around and I write it off as the start of the media swarming this otherwise quiet Southern landmark for the anniversary. Then more media arrive, and it becomes apparent I have stumbled into an event I need to shoot. A press secretary arrives and informs us “he” will be arriving soon to walk across the bridge. Who is "he?" 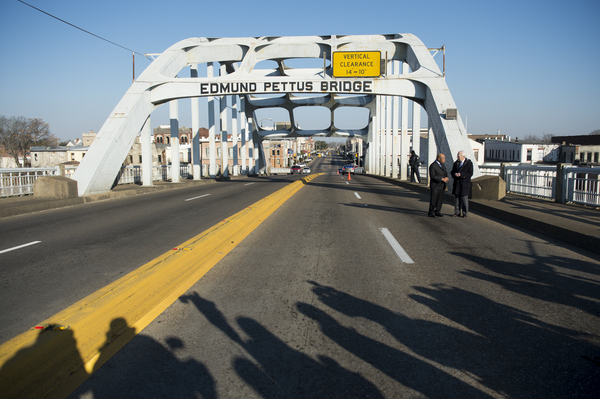 I decide it&apos;s probably an elderly local Selma resident who walked the bridge 50 years ago. Police begin blocking traffic lanes on the bridge and then a black sedan pulls up — which is when I realize “he” is none other than Rep. John Lewis, D-Ga., the man who helped lead the March 7, 1965, march and was beaten savagely by Alabama state troopers and vigilantes. Lewis begins with a walking interview with CBS’ Bob Schieffer. He does another with CNN, then again with the Atlanta television news channels and a few local media outlets. He finishes up with a bunch of still photographers, myself included, shooting portraits on the iconic bridge. While Roll Call sent me to Selma to do a story on the town’s member of Congress, Democratic Rep. Terri A. Sewell, capturing Lewis on the bridge was total luck — made possible only by putting in the extra effort to catch some nice sunrise light. As Bruce Springsteen wrote, "When it comes to luck, you make your own." Related: Terri Sewell Proves You Can Come Home Again Native Son Bidding for a Sweet Return to Montgomery | Life After Congress This Is Today’s Selma The ‘Real Congresswoman From Selma’ Has Her Say Heard on the (Goat) Hill What to See and Do in Selma The Selma to Montgomery Bicycle Ride: Civil Rights and Bamas Get breaking news alerts and more from Roll Call in your inbox or on your iPhone.